The dairy company Anchor has launched a new advert, promoting Anchor Spreadable. The 30-second spot features the grandma Huggler looking for butter in the fridge and finding instead a pack of Anchor Spreadable. “Anchor Spreadable? What’s that?” – she asks to herself, and – to her surprise – receives an answer from a woman’s voice coming from a voice controlled device: “Anchor Spreadable is real butter blended with rapeseed oil.” Not knowing where the voice came from, grandma Huggler puts the pack at her ear and then says “Thank you” several times as if she was thanking it. Seeing her doing this, her son tells his wife that they must start looking for nursing homes. Even though he whispered, the speaker placed on the kitchen table informs him – loud and clear – which is the nearest nursing home. The grandma, who’s spreading some Anchor on a slice of bread, tells them that she will outlive both of them. According to the brand, Anchor Spreadable is made with 100% British milk and contains no palm oil, hydrogenated fats, artificial colourings or preservatives. 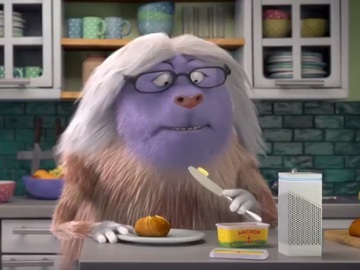 The Hugglers, a family of yeti-like creatures, have appeared in UK adverts for Anchor since June 2015, promoting Anchor Cheddar and Anchor Spreadable.